This is one of my favorite films. I was very excited to learn that this was going to be one of Twilight Time’s releases. They didn’t let me down yet again in the mastery they show to important pieces of cinema. This is a truly a gorgeous film in so many wonderful ways. The sets, costumes are breathtaking. The utter fantastic cinematography. The amazing direction, and most of all flawless performances by all involved. This is one of those films I return to over and over again. I am a lover of blu-ray, and this is kind of a big deal for me, being able to own this film. This film was treated with amazing care, and crafted through an excellent transfer. I love literature. I love reading. Something many people don’t know about me is I am a book fiend. I read constantly. A little self-promotion I also review, and run my own book page www.classicbookreading.com where I review books, instead of movies. Jane Austin is one of my favorite writers. I have read all her books, and enjoy the many film adaptions of her work. Director Ang Lee brought her visionary talent from page, to his visionary talent on screen. This is a wonderful example of Austin’s vision made into a film of importance, and great care, and love to her vision. Ang Lee is one of the most fascinating directors ever to grace the world of film making. His many films, always stand out. He is a master talent that knows what he wants, and creates that ultimate vision for the viewer. Sense and Sensibility is a prime example of that expertise. Starring the amazing, beautiful and very talented Emma Thompson. Thompson is a beautiful soul on screen. I absolutely love her. She captures the character of Elinor Dashwood in a flawless way. That is something so important about this film is the amazing ensemble cast of performers. The extraordinary, gorgeous Kate Winslet. Winslet is breathtaking and utterly flooring as an actress. She always makes me giddy watching her. She plays the character of Marianne with perfection. Also starring the amazing, underrated actor James Fleet as John Dashwood. The wonderful Hugh Grant as Edward Ferrars. And also starring the one and only master, talented, perfected actor Alan Rickman. Rickman is one of the greatest actors of all time. He is one of my favorites, and I always make it a goal to see all his movies. He plays the character of Colonel Brandon in Sense and Sensibility. The whole cast is amazing and each one bring to life unforgettable characters, in unforgettable performances. The plot is true to all of Austin’s books. A death, lack of money, love, courtship. On his deathbed Mr. Dashwood tells his son John to take care of his second wife and their three daughters. By accustom they will inherit nothing. John agrees but his greedy wife Fanny, changes his mind, and gives them hardly anything. Soon John and his wife Fanny move into the big house, forcing the second wife, and the daughters, Elinor, Marianne and Margaret to find a place to stay. Meanwhile Fanny invites her brother Edward to stay. Soon Elinor and Edward take to liking to each other, but Fanny has no part of this and tells Mrs. Dashwood that Edward would not inherit anything if he was to marry someone of no importance, basically referring to her daughter Elinor. Soon the daughters and Mrs. Dashwood is offered to stay in a small cottage house by a cousin, solving their home situation. Soon the other daughter Marianne catches the eye of Colonel Brandon, and so begins like in Jane Austin fashion, the trials of love, money and importance. The movie changes many things, and also adds to the plot. This reality never takes away from the story, it just adds more wonder to the plot. This was honored and praised by many and rightly it should be. This film received many awards, and nominations, including over 7 Academy Award Nominations. Emma Thompson who also wrote the screenplay for this movie, also won the Academy Award for Best Adapted Screenplay. Breathtaking cinematography by Michael Coulter. Which he was nominated for an Academy Award for Sense and Sensibility, which I personally feel he should have won. The direction, acting, music, sets, costumes, cinematography is all perfection, equaling a flawless film. 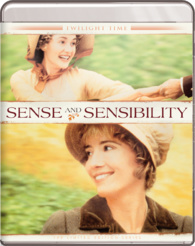 Sense and Sensibility is one of those films that is a grand achievement in film making. This has never sounded or looked any better. I have seen this on VHS, TV, DVD but this Blu-ray is what it’s all about. Amazing transfer and utterly flawless sound. Simply put, pure perfection. This is loaded with a wonderful array of Special Features. The new and always amazing Isolated Score Track. The music is by Scottish composer Patrick Doyle, who is a flawless example of how important film scores are. He is a master talent who has done many examples of flawless composing for movies like Henry V (1989), Needful Things (1993), Hamlet (1996), 1997’s Donnie Brasco, 2001’s Gosford Park and many others. He is a wonderful, talented musician that allows the music to come to life. Audio Commentary with Actress Emma Thompson and Producer Lindsay Doran. Always a wonderful listen to hear the ones involved in the film talk about their experience. Emma Thompson is flawless. Audio Commentary with Director Ang Lee and Co-Producer James Schamus. Another great listen. Lee is a master film maker and hearing him talk is always a priceless treat. Twilight Time has done it again in bringing an important piece of cinema to a new wonderful outlet. This blu-ray is amazing and is something to own. This 3,000 unit production of this important piece of cinema, and one of Jane Austin’s greatest works turned into one of the greatest film adaptions ever done of her work. This is a lovely new blu-ray to praise and give huge accolades to. Another fantastic product by Twilight Time.